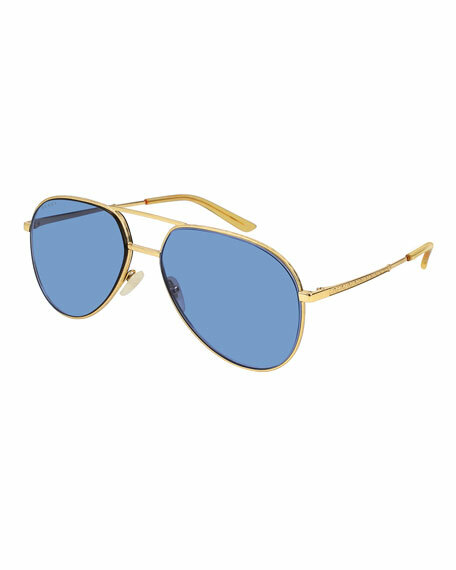 Gucci aviator sunglasses from '18 Fashion Show. Lens/bridge/temple (in mm): 60-13-145. Double nose bridge; straight brow bar. Brown lenses. Wide nose pads. Logo detail at temples. Universal fit. Made in Japan. Gucci aviator glasses from '18 Fashion Show. Lens/bridge/temple (in mm): 60-13-145. Double nose bridge; straight brow bar. Clear sun lenses with AR coating. Wide nose pads. Logo detail at temples. Universal fit. Made in Japan.